I attended the weekly Bible study at Professor Gash‘s house last evening, and Ambassador Douglas W. Kmiec, a member of our esteemed faculty, was the guest speaker. Ambassador Kmiec is teaching Constitutional Law to one of our 1L sections this semester. Ambassador Kmiec has a fascinating story, and he shared much of it with the crowd of students in attendance. You can read the gist of his tragic, yet hopeful story in an L.A. Times interview published last October. Today, we will host a Deans Forum during our lunch break. Typically, we host a couple of these each year. Deans forums are simply an opportunity for the law school administration to share updates on topics of interest and then field comments and questions from students. All administrators with dean titles are invited to be on hand to answer questions that may arise in regard to their respective areas. At the end of each deans forum, the administrators clear out of the room and turn over the floor to our Student Bar Association officers. This provides students a chance to share concerns with their representatives. Today, Dean Tacha has several updates to share, and I will provide a short update on how Pepperdine students performed on last summer’s bar exam. 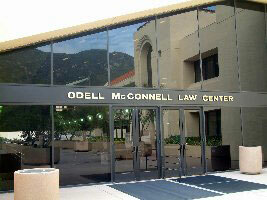 When you visit the Pepperdine University School of Law, you cannot help but notice the official name of the building as you enter our front doors: the Odell McConnell Law Center. Many students come in and out of these doors for years without knowing anything of the man whose name they pass under each day — which is a shame. Ted Taylor, one of the great members of our law library team, became an expert on the life of Odell McConnell and produced an online book about him a couple of years ago, complete with pictures and documents from his impressive life (you can read the book HERE). This year, for the first time, the law library is hosting a little celebration to commemorate Odell McConnell’s birthday (January 29, 1897, which is 116 years ago today!). It will simply be some cake and punch, with a little slideshow in the background prepared by Ted. It has been 116 years since Odell McConnell was born — and 21 years since his passing. However, he has not been forgotten, and his legacy continues on here at Pepperdine Law. Living in Malibu is an adventure all by itself. For me, having grown up in rural Arkansas, the periodic celebrity encounter at the grocery store is still difficult to accept as normal. It is even more fun to see a famous face at the law school. I first knew the name Roger Cossack during the O.J. Simpson trial in the mid-1990s when he became a television legal analyst and CNN talk show host. Eventually, however, as a sports fan, I knew his name well as the one ESPN turned to when sports and law intertwined (e.g., “Next on Sports Center, ESPN legal analyst, Roger Cossack, talks about the steroids scandal.”). Professor Jim Gash had a unique idea over the semester break, and I loved it. He noted that upper division students often continue the same essay-writing mistakes on final exams that they made during their first year of law school. His thesis was that these students, for the most part, never get the opportunity to compare papers that receive high marks with those that receive low marks. With those thoughts in mind, yesterday’s ASP session came to life. With permission from his class, Professor Gash made copies of six anonymous student essays from last semester’s Torts exam, ranging from high scores to low scores. We passed out copies of each of these essays, along with the essay exam and scoring sheet, to the eighty-five 1Ls that attended yesterday’s session (all 1Ls were invited). After a brief lecture on essay-writing, Professor Gash gave the students quiet time to read all six essays and rank them from top to bottom. Although there was variation among the votes, we discovered that the essay with the top score received the most votes among the students as the top scoring essay. The same held true for the second highest scoring essay, and the third, and the fourth, and the fifth, and the sixth. Professor Gash’s initial thesis held true, that it is possible for every student to see the difference in essays that will receive more points than others. The next step in his thesis is that students that can see the difference can DO it, too! I thought yesterday’s session was a wonderful opportunity for students, and I am indebted to Professor Gash for the idea and for the time devoted to serving our students. I am convinced that it will prove beneficial for many. I was able to attend last Friday’s symposium, and it was fantastic. Today, I simply want to share a link to Professor Caron’s excellent review. Watching the festivities surrounding yesterday’s presidential inauguration made me think of our students working and studying in D.C. this semester. Thereafter, I realized that many of you may not know about this relatively new opportunity! It is unsurprising that Washington, D.C. is a place of interest for students interested in the law. To that end, Pepperdine Law initiated a spring semester externship program a couple of years ago to give students the opportunity to work in the place that our nation’s laws are made, interpreted, and carried out. I believe we had one student there in 2011. We had four students take advantage of this opportunity in 2012. This year, we have nine students in the program! As you can tell, it is growing in popularity, and for good reason. No classes at the School of Law today in honor of Martin Luther King, Jr. Day. HERE is a link to the events at Pepperdine surrounding this holiday. Professor Bernie James is deeply involved in the first ever MLK Memorial Day Tribute Concert event taking place tonight on lower campus. It is a big day at the law school! Today is the day for our tax law symposium, hosted by the Pepperdine Law Review. I arrived at work before 7am, and 3L Michael Wood was already here setting up for this great event. Michael is on the editorial board of the law review and is responsible for coordinating today’s symposium! For those interested, I noticed that there will be a live webcast of the event! Go HERE to join in on the symposium from wherever you are today.